With a clean desk, I am getting new ideas. Actually this one has been percolating in my brain for a while. I was inspired to paint my bed by Van Gogh's famous painting of his bed in his room in his yellow house in Arles, France. He painted 3 versions of this room. Our bed in San Diego in the blue green grey house. Here is the rest of my new idea about painting beds. We have a big homeless problem in our country. I read about the problems in Los Angeles daily as they gentrify downtown L.A. and push the homeless out of their shelters and encampments. Its a big problem and there is no easy solution. I read an article somewhere about providing beds for the homeless and after reading that, my brain began connecting some dots. What if I did commissioned bed portraits? 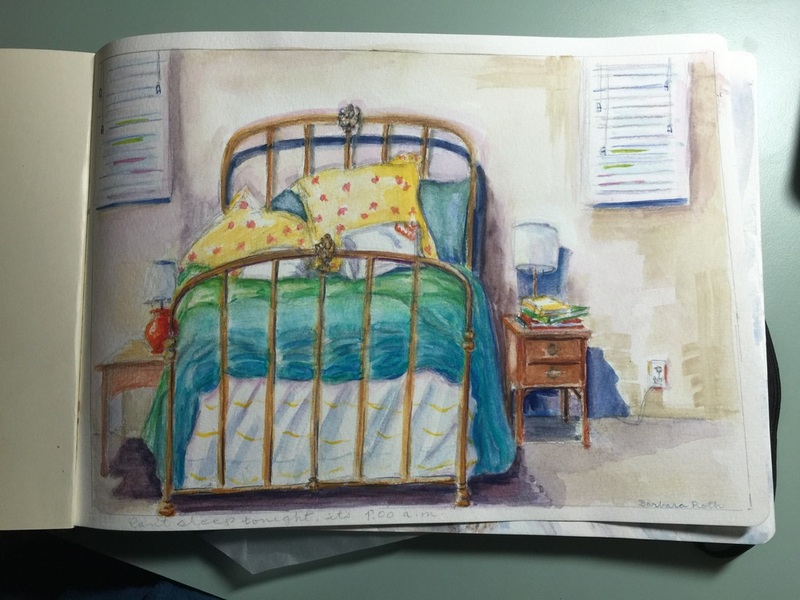 Haven't many people always dreamed of someday having a portrait of their bed? I will charge a fee (to be determined) for each bed portrait and then donate a portion of it to an organization that helps the homeless. What do you think? If you have any ideas on how I can refine my new idea, please send them along to me. Definately contact me if you would like a bed portrait, and take a photo of your bed to send to me to create your bed portrait.